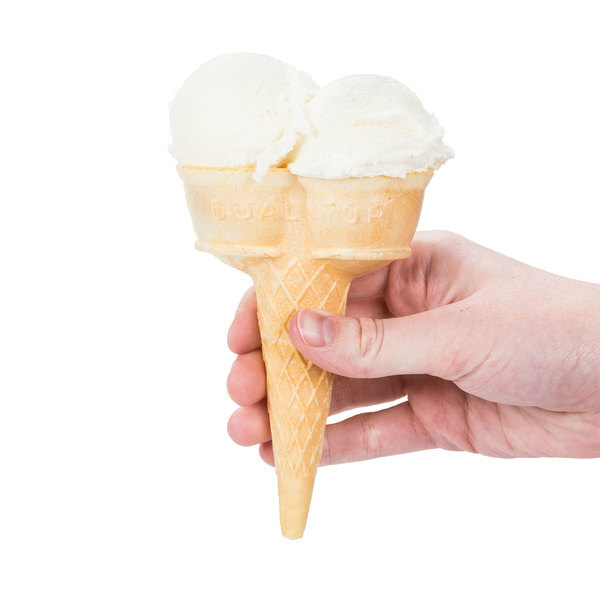 Serve your patrons not one, but two of their favorite ice cream flavors with these Joy cake twin scoops ice cream cones! Family owned and operated since 1918, Joy is an old-fashioned favorite that continues today as the leading ice cream cone company. From mixing the batter to the baking process, quality and great taste is ensured with each and every Joy cone. These cake cones are made with a combination of three flours: pastry, cake, and tapioca. This combination produces a lighter, flakier cone with a subtly sweet taste that does not overpower the ice cream. With Joy's twin scoop design, there's room for multiple scoops of ice cream in one cone! The two rounded cups displays your scoops side by side, rather than stacked on top of each other. The cone's pointed bottom is classic, yet its dual top is fresh and new! Made with no artificial ingredients, these cones are great for ice cream shops, bakeries, restaurants, and more. They enhance the appearance, taste, and texture of your most popular ice cream flavors, custard, or frozen yogurt! Mouth Width: 3 5/16" x 1 11/16"
Inner Diameter: 2 15/16" x 1 7/16"
Just like previous reviewers, these cones are not sturdy and easily breakable. A good bit have holes in the top part which adds to the delicacy of the cones. I would not recommend this cone. perfect for when customers want two different flavors and want small scoops. leaving customers with their satisfactions and cravings right. cones are highly recommended ! Customers love being able to buy something different. These are right up that alley. We started selling these this summer in our ice cream shop and they were a huge hit with kids and adults. A great idea for a cool way to serve two different ice cream flavors. The cone tastes great, but it is very fragile. You must handle it very cautiously. This product reminds us of our youthful trips to the ice cream stand. This "retro" look proved to be a popular addition to our cone line up. Interesting cones, able to serve two different flavors of hard ice cream side by side. This makes things easy, especially if you don't want two flavors on top of each other. These cones are great for that double scoop treat. Side by side for ice cream is better than one on top of the other and easier to handle and eat. These cones "bring it back" for some of our customers! Unfortunately 50% of the cones came broke in shipment. They are a bit more delicate than a typical cake cone...just beware before purchasing. I would recommend a #12 or #16 scoop as well, The openings are small. Overall not a good value for our use. Thank you for your review, Nick! We are very sorry to hear that these were broken upon arrival. A Customer Solutions Representative will contact you shortly to make sure that this is made right. I'm glad that the cones came in on time, but at least 40% of the cones were damaged. I frequently buy cones from here and never have a problem. Thank you for your review, Jose! We are sorry to hear that these cones arrived broken. A Customer Solutions Representative will contact you soon to make sure these are credited to your account. This item is terrible. I should have examined the dimensions more closely. 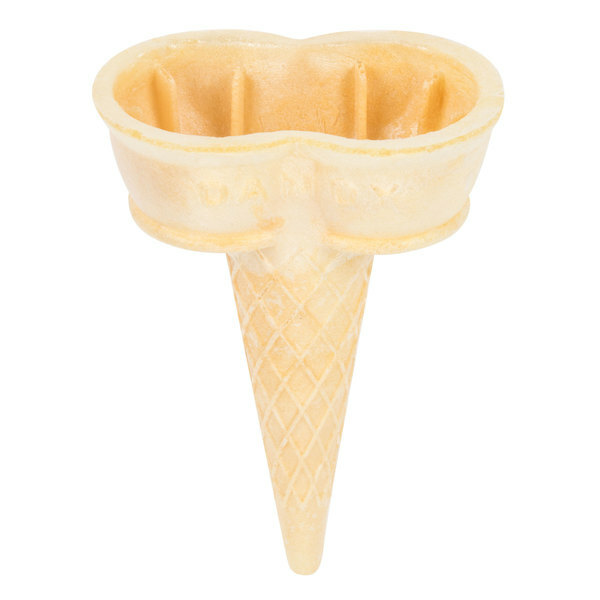 We make our own waffle cones and use Joy Cone #30, i thought this would be a fun addition and make double scoops more exciting. The size of this cone is smaller than our existing Joy Cone we are using and in no way can hold 2 scoops. Considering you basically pay twice as much for a cone that doesn't even have a dispenser, it should at least work. Thank you for your review! We're sorry to hear that these cones were smaller than expected. Feel free to browse our extensive selection of Ice Cream Cones to find the perfect ones for your business. My kids love ice cream! A double scoop cone is something cool that they don't find at the store. They are even great for making cupcakes in too.